Page Summary: Quotes & Links for 50+ Science News Reports Regards Meat & Dairy Consumption Causing a Large % of Climate Change via Greenhouse Gas Production (Carbon/Methane Footprints of Food); and How it Causes Mass Pollution, Depletes Soils & Wastes Large Amounts of Our Fresh Water, Edible Plant Crops, Fossil Fuels & Agricultural Land. Related pages contain Science Reports on Deforestation & the Dying Oceans. BBC 2018 “Climate change food calculator: What’s your diet’s carbon footprint?” … Excerpts: “Avoiding meat and dairy products is one of the biggest ways to reduce your environmental impact, according to recent scientific studies … Food production is responsible for a quarter of all greenhouse gas emissions, contributing to global warming, according to a University of Oxford study … Their findings showed that meat and other animal products are responsible for more than half of food-related greenhouse gas emissions, despite providing only a fifth of the calories we eat and drink. Excerpts: “The new research shows that without meat and dairy consumption, global farmland use could be reduced by more than 75% – an area equivalent to the US, China, European Union and Australia combined – and still feed the world. Loss of wild areas to agriculture is the leading cause of the current mass extinction of wildlife. The new analysis shows that while meat and dairy provide just 18% of calories and 37% of protein, it uses the vast majority – 83% – of farmland and produces 60% of agriculture’s greenhouse gas emissions. Other recent research shows 86% of all land mammals are now livestock or humans. “By the numbers: GHG emissions by livestock. – Cattle (raised for both beef and milk, as well as for inedible outputs like manure and draft power) are the animal species responsible for the most emissions, representing about 65% of the livestock sector’s emissions. – In terms of activities, feed production and processing (this includes land use change) and enteric fermentation from ruminants are the two main sources of emissions, representing 45 and 39 percent of total emissions, respectively. Manure storage and processing represent 10 percent. The remainder is attributable to the processing and transportation of animal products. – Cutting across all activities and all species, the consumption of fossil fuel along supply chains accounts for about 20 percent of the livestock sector’s emissions. From the UN-FAO in 2006: “When emissions from land use and land use change are included, the livestock sector accounts for 9 percent of CO2 deriving from human-related activities, but produces a much larger share of even more harmful greenhouse gases. It generates 65 percent of human-related nitrous oxide, which has 296 times the Global Warming Potential (GWP) of CO2. Most of this comes from manure. From a 2018 article on the World Economic Forum website: “The unbelievably simple way to cut greenhouse gas emissions in half … If we all swapped beef burgers and bacon sandwiches for vegetarian alternatives most of the week, we could cut greenhouse gas emissions by more than half. 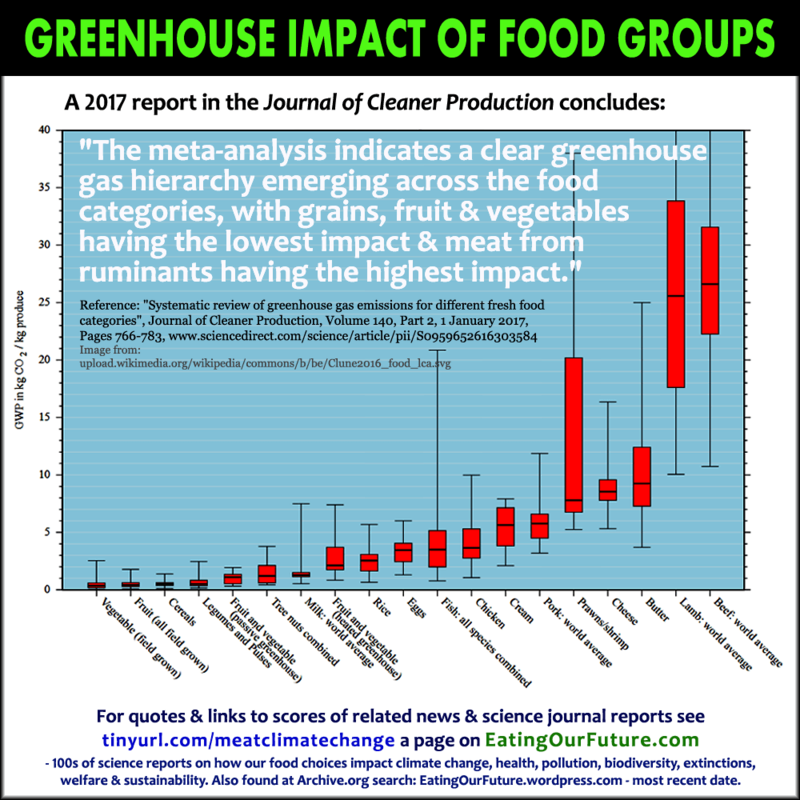 From the Environmental Science and Technology journal: “Livestock farming incurs large and varied environmental burdens, dominated by beef … Here we show that protein-equivalent plant based alternatives to the beef portion of the mean American diet are readily devisable… We then show that replacement diets require on average only 10% of land, 4% of greenhouse gas (GHG) emissions, and 6% of reactive nitrogen (Nr) compared to what the replaced beef diet requires. The CNN diagram refers to the report titled “Ruminants, Climate Change and Climate Policy”. An excerpt: “Methane (CH 4) is the most abundant non-CO 2 greenhouse gas and because it has a much shorter atmospheric lifetime (~9years) than CO 2 it holds the potential for more rapid reductions in radiative forcing than would be possible by controlling emissions of CO 2 alone. There are several important anthropogenic sources of CH 4 : ruminants, the fossil fuel industry, landfills, biomass burning and rice production (Fig.1c). From a 2017 article in the New York Times: “The impact of factory farms on climate change is also profound. These operations generate more greenhouse gas emissions than all forms of transportation combined. Factoring in increases in world population, a 2014 study in the journal Climatic Change found that food-related greenhouse gas emissions may take up most of the world’s remaining carbon budget  – or the amount of greenhouse gases that can still be emitted and keep global temperatures in 2050 to no more than 2 degrees Celsius (3.6 degrees Fahrenheit) above preindustrial levels. Dietary changes that involve reduced meat and dairy consumption “are crucial for meeting” the 2050 temperature target “with high probability,” the study concluded. “Three meat companies – JBS, Cargill and Tyson – emitted more greenhouse gases last year than all of France… the top 20 meat and dairy companies emitted more greenhouse gases in 2016 than all of Germany, Europe’s biggest climate polluter by far. If these companies were a country, they would be the world’s 7th largest greenhouse gas emitter. 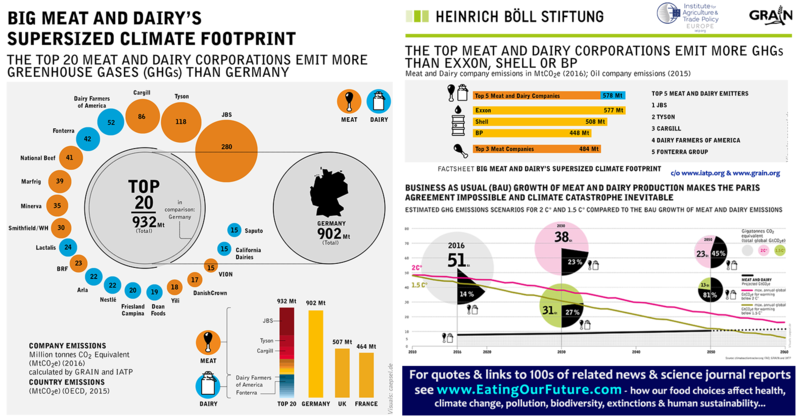 It’s now clear that that the world cannot avoid climate catastrophe without addressing the staggering emissions from the largest meat and dairy conglomerates…” from article at https://www.grain.org/article/entries/5825-big-meat-and-dairy-s-supersized-climate-footprint with related infographics. Meanwhile, the most immediate threat of climate change for most of the global population will be at the dinner table, as our ability to grow critical staple crops is being affected by the warming we’ve already experienced. Between 1980 and 2008, for instance, wheat yields dropped 5.5 % and maize yields fell 3.8% due to rising temperatures. Climate change threatens the food security of millions of poor people around the world. While farming alone accounts for 10-12% of global greenhouse gas emissions, when we look at entire food systems the contributions to climate change more than double. A recent report published by the Meridian Institute lays out the many factors throughout food systems that spell trouble for the climate, and also explains why a broad systems-wide perspective is necessary for implementing effective changes. 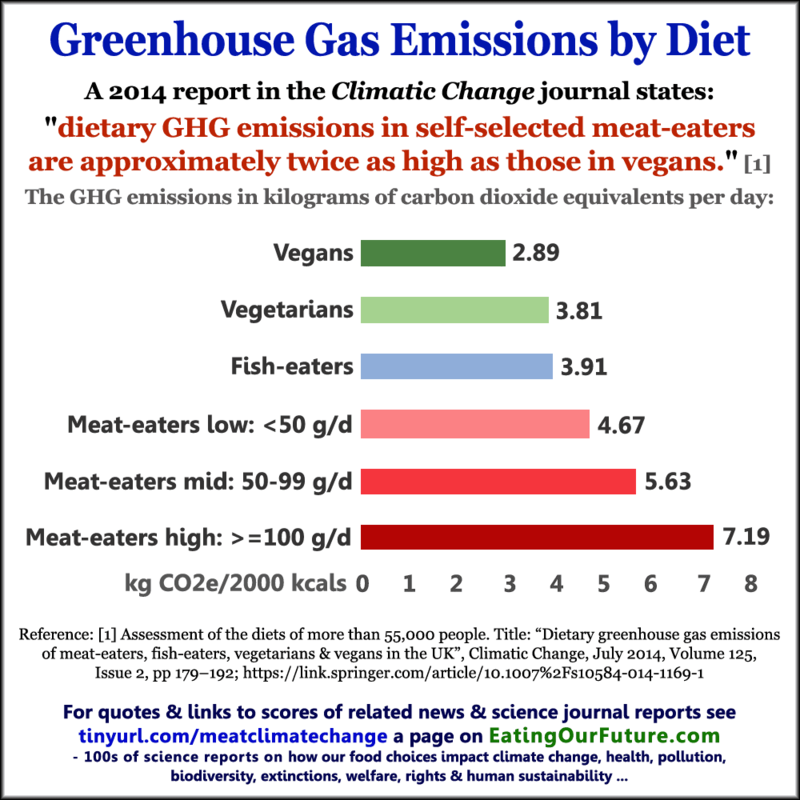 Carbon Footprints: The Greenhouse Gas Emissions of Food Products – Meat and Dairy Produces Much Higher Amount of GHGs Compared to Plant Foods. 2018 report on The Guardian news site: “livestock production represents 14.5% of all greenhouse gas emissions, [yet] almost 72% of companies provided little or no evidence to show that they were measuring or reporting their emissions. Some 19 companies received the lowest possible mark in this section, including Australia Agricultural Company, Cal-Maine (a US company…), Russian Cherkizovo and Indian Venky’s. This, the report argues, may be “putting the implementation of the Paris agreement in jeopardy”. The Guardian approached these companies for comment but received no response. From the results section re: Emissions Impacts. A related video presentation by A Well Fed World is on Facebook. – Grass-fed beef generates 19 per cent more emissions per kilogram than grain-fed beef, largely because grass is less nutritionally dense. Cattle need to eat more grass to get the same nutrition as they would from a smaller amount of grain, they grow more slowly, and must be raised for a longer time before slaughter, generating more emissions. The difference is so small that by taking a short drive to pick up local food, you could end up generating more emissions than if you walked to the nearest store to grab something imported. On the other hand, both Wynes and Clark found that switching to a plant-based diet could make a huge difference. Wynes found going from omnivore to vegetarian could reduce your personal carbon emissions by about 0.8 tonnes per year — a bigger difference than replacing your gasoline-powered car with a hybrid. Going from omnivore to vegan would reduce your emissions by 0.9 tonnes per year. From the journal Environmental Research Letters, 2018: “We model a nationwide transition from grain- to grass-finishing systems using demographics of present-day beef cattle. In order to produce the same quantity of beef as the present-day system, we find that a nationwide shift to exclusively grass-fed beef would require increasing the national cattle herd from 77 to 100 million cattle, an increase of 30%. “Soil degradation includes erosion, desertification, and other changes in soil that reduce its capacity to provide ecosystem services. Excerpts: “Livestock causes far more climate damage than first thought, says a new report … In a paper published by a respected US thinktank, the Worldwatch Institute, two World Bank environmental advisers claim that instead of 18 per cent of global emissions being caused by meat, the true figure is 51 per cent. They claim that United Nation’s figures have severely underestimated the greenhouse gases caused by tens of billions of cattle, sheep, pigs, poultry and other animals in three main areas: methane, land use and respiration. Their findings… come amid increasing calls from climate change experts for people to eat less meat. From a UNESCO report: “In November 2009, Goodland and Anhang of the World Bank, released a report in the periodical Worldwatch stating that the 2006 FAO report appears to have underestimated the worldwide total amount of GHG emissions attributable to livestock production. They calculated an additional 25,048 million tons of carbon dioxide equivalents attributable to livestock undercounted or overlooked in the 2006 FAO calculations (7,516 million tons). Based upon their new calculations, at least 32,562 million tons of carbon dioxide equivalents or at least 51% of all GHG emissions are attributable to livestock production. A 2019 report in Forbes: “Meat And Agriculture Are Worse For The Climate Than Power Generation, Steven Chu Says” – the new president of the American Association for the Advancement of Science, 1997 Nobel Prize winner in physics and former U.S. Secretary of Energy. Excerpts: “The world has focused first on energy in its effort to stop greenhouse gas emissions, but former Energy Secretary Steven Chu puts agriculture at the top of his list of climate challenges—particularly animal agriculture. From the Proceedings of the National Academy of Sciences, a 2018 report on the food loss inherent to animal agriculture systems – summary excerpt: “With a third of all food production lost via leaky supply chains or spoilage, food loss is a key contributor to global food insecurity. Demand for resource-intensive animal-based food further limits food availability. In this paper, we show that plant-based replacements for each of the major animal categories in the United States (beef, pork, dairy, poultry, and eggs) can produce twofold to 20-fold more nutritionally similar food per unit cropland. 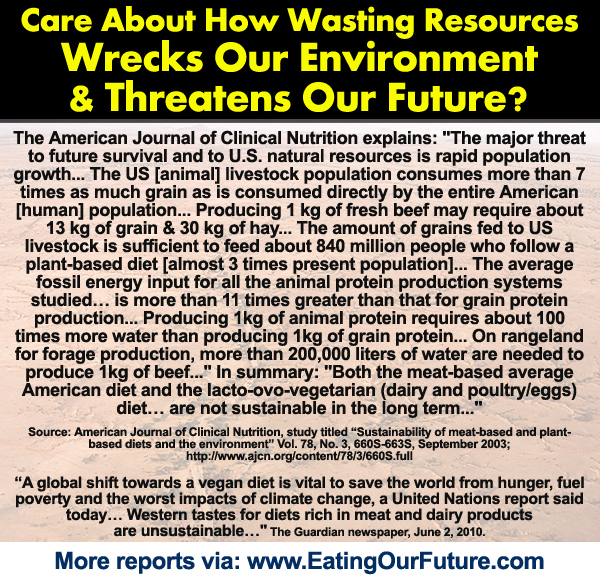 A 2003 report in the American Journal of Clinical Nutrition is titled “Sustainability of meat-based and plant-based diets and the environment.” The conclusion states: “Both the meat-based average American diet and the lacto-ovo-vegetarian (dairy and poultry/eggs) diet… are not sustainable in the long term based on heavy fossil energy requirements. For many more reports about how our food choices are decimating life in the oceans and of the higher disease risks associated with eating seafood, click those links. According to a research study conducted by the University of Michigan, a quarter-pound Beyond Burger requires 99 % less water, 93 % less land and generates 90 % fewer greenhouse gas emissions, using 46 % less energy to produce in the U.S. than its beef equivalent. As Member of the National Academy of Medicine and Professor of biochemistry at Stanford University in 2009, O. Brown … wanted to assess which global problems are the most urgent and which he could help to solve. Using animals for food makes up the vast majority of the land footprint of humanity. All the buildings, roads and paved surfaces in the world occupy less than one per cent of Earth’s land surface, while more than 45 % of the land surface of Earth is used as land for grazing or growing feed crops for livestock. The Impossible Burger requires approximately 75 % less water and 95 % less land, generating about 87 % lower greenhouse gas emissions than beef burgers. methane from human activity – approximately two-thirds of the total – is produced in two ways: the odourless and colourless gas leaks during the production and transport of coal, oil and especially natural gas; and, in roughly equal measure, from the flatulence of ruminants such as cattle and sheep, as well as the decay of organic waste, notably in landfills. “Meet the world’s top destroyer of the environment. It is not the car, or the plane, or even George Bush: it is the cow. Burning fuel to produce fertiliser to grow feed, to produce meat and to transport it – and clearing vegetation for grazing – produces 9 per cent of all emissions of carbon dioxide, the most common greenhouse gas. And their wind and manure emit more than one third of emissions of another, methane, which warms the world 20 times faster than carbon dioxide. Livestock also produces more than 100 other polluting gases, including more than two-thirds of the world’s emissions of ammonia, one of the main causes of acid rain. Ranching, the report adds, is “the major driver of deforestation” worldwide, and overgrazing is turning a fifth of all pastures and ranges into desert. Cows also soak up vast amounts of water: it takes a staggering 990 litres of water to produce one litre of milk. Wastes from feedlots and fertilisers used to grow their feed overnourish water, causing weeds to choke all other life. And the pesticides, antibiotics and hormones used to treat them get into drinking water and endanger human health. The pollution washes down to the sea, killing coral reefs and creating “dead zones” devoid of life. One is up to 21,000sqkm, in the Gulf of Mexico, where much of the waste from US beef production is carried down the Mississippi. shellfish were releasing these gases long before global warming became an issue … recent emissions may have been exacerbated by the enrichment of coastal waters, due to the run-off from agricultural fertilisers. A recent paper in the journal Science of the Total Environment suggests that our consumption of meat is likely to be “the leading cause of modern species extinctions”. Not only is livestock farming the major reason for habitat destruction and the killing of predators, but its waste products are overwhelming the world’s capacity to absorb them. Factory farms in the US generate 13 times as much sewage as the human population does. Livestock farming creates around 14% of the world’s greenhouse gas emissions: slightly more than the output of the world’s cars, lorries, buses, trains, ships and planes. If you eat soya, your emissions per unit of protein are 20 times lower than eating pork or chicken, and 150 times lower than eating beef. 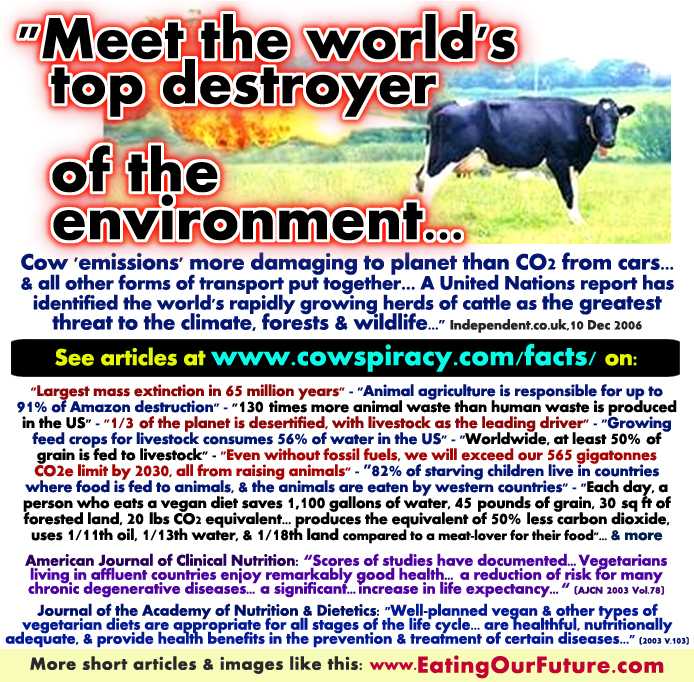 TIME magazine article: “Silence the Cows and Save the Planet.” Excerpts: “Flatulent cows are not a laughing matter… The emissions produced by nature’s woodwind section contain a nasty mix of many gasses, among them methane. Though carbon dioxide is the first gas that comes to mind when we think of greenhouse emissions, pound for pound, methane is more than 20 times more powerful in terms of its global warming potential. Methane doesn’t linger in the atmosphere quite as long as CO2, and it’s not produced industrially in anywhere near the same quantity, but it does its damage all the same — and livestock toots out a surprisingly large share of it. Time magazine 2013: “You may think you live on a planet, but really you live on a gigantic farm, one occasionally broken up by cities, forests and the oceans. Some 40% of the world’s land surface is used for the purposes of keeping all 7 billion of us fed — albeit some of us, of course, more than others. And the vast majority of that land — about 30% of the word’s total ice-free surface — is used not to raise grains, fruits and vegetables that are directly fed to human beings, but to support the chickens, pigs and cattle that we eventually eat. “You write that eating a pound of beef has more impact on climate change than burning a gallon of gasoline. Explain. In Australia, livestock farming accounts for 10% to 16% of greenhouse gas emissions, with dairy farms contributing 19% of this, or 3% of total emissions. Methane emissions, from digestion and manure, and nitrous oxide from livestock are significant contributors. Globally, the livestock sector is responsible for more greenhouse gases than the world’s transport. Research shows that we must reduce food waste and losses in the supply chain and change our diets toward less resource-intensive diets, such as a plant-based diets. Doing so would cut emissions by two-thirds and save lives. It’s possible to eliminate animal suffering and reduce carbon emissions by reducing and replacing livestock production and consumption. Many of the EWG’s findings are pretty eye-opening — like some revealing facts about beef, which produces twice the emissions of pork, four times as much as chicken, and 13 times that of vegetable protein such as beans, lentils, and tofu. That’s especially alarming since we waste so much meat — ultimately throwing away about 20% of what we produce — meaning that all that carbon was generated for nothing. The USDA’s related findings about emissions related to milk and cheese came from a study it conducted of a single commercial dairy with 10,000 milk cows in southern Idaho… If you think that kind of operation can produce a lot of noxious discharge, you’re right. The investigators monitored a year’s worth of ammonia, carbon dioxide, methane, and nitrous oxide emissions and found that this one dairy gives off 3,575 pounds of ammonia, 33,092 pounds of methane, and 409 pounds of nitrous oxide per day. Now consider that there are 365 days in a year and tens of thousands of dairy farms in the U.S.
An analysis of meat, egg, and milk production encompasses not only the direct rearing and slaughtering of animals, but also grain and fertilizer production for animal feed, waste storage and disposal, water use, and energy expenditures on farms and in transporting feed and finished animal products, among other key impacts of the production process as a whole. 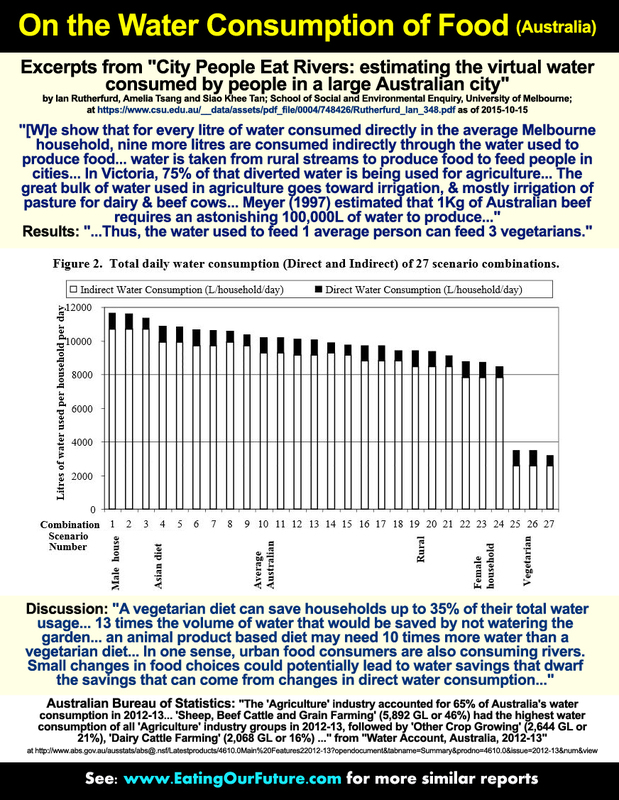 From an article titled “Water footprint of crop and animal products: a comparison” some excerpts: “The projected increase in the production and consumption of animal products is likely to put further pressure on the globe’s freshwater resources. The size and characteristics of the water footprint vary across animal types and production systems. The water footprint of meat from beef cattle (15,400 m 3 /ton as a global average) is much larger than the footprints of meat from sheep (10,400 m 3 /ton), pig (6000 m 3 /ton), goat (5 500 m 3 /ton) or chicken (4 300 m 3 /ton). The global average water footprint of chicken egg is 3 300 m 3 /ton, while the water footprint of cow milk amounts to 1000 m 3 /ton. Reference: http://waterfootprint.org/en/water-footprint/product-water-footprint/water-footprint-crop-and-animal-products/ – has links to several more related reports. From a 2015 article in Mother Jones titled “We’ll All Eat Less Meat Soon – Like It or Not” an excerpt: “Is the feedlot system itself sustainable? That is, can we keep stuffing animals—not just cows but also chickens and pigs—into confinements and feeding them gargantuan amounts of corn and soybeans? And can other countries mimic that path, as China is currently? Excerpts: “This World Environment Day marks 10 years since the UN described the livestock sector as ‘one of the most significant contributors to the most serious environmental problems, at every scale from local to global,’ but has anything been done in the subsequent decade to address such a grave warning? The landmark report Livestock’s Long Shadow, in which the UN called for ‘urgent action’ in 2006, offered great hope for change at a policy level. Instead, nothing. No policies, no initiatives or any kind of public education campaign aimed at trying to curb climate emissions from farming animals. Just freedom for the sector to carry on with business as usual. Last year’s UN Climate Change Conference in Paris presented a ready-made opportunity to agree carbon cutting obligations in specific areas. Animal products were all over the world leaders’ menus, but left completely off their agenda. The Paris Agreement, signed by 196 countries, omitted any mention of livestock, agriculture or animals across its 31 pages. The past 10 years of governmental apathy in this area has been an injustice of the highest order, and cannot be repeated. Animal agriculture is responsible for at least 14.5% of global greenhouse gas emissions, more than all transport combined. It must not continue to be shielded from scrutiny and afforded protected status given the severity of the implications. It’s not just a climate issue. One in nine of the world’s population – almost 800 million people – go hungry, yet enough grain to feed up to 3.5 billion people is fed to livestock. Deforestation is also occurring at an alarming rate with the World Bank estimating that animal agriculture is responsible for up to 91% of Amazon destruction. Nor are the problems a result of just meat production. The dairy industry, far from its perception as an innocuous by-product, is every bit as destructive, alone accounting for roughly 4% of global greenhouse gas emissions. Your average cow produces around 700 litres of methane per day, which is the equivalent of a large 4×4 vehicle travelling 35 miles in a day. Farmers are struggling. So much so that half of all UK dairy farmers are reported to be intending to quit their sector. English dairy farmers receive around a third of their income in EU subsidies amounting, on average, to around £25,000 per dairy farmer per year. Rather than continue propping up a failing industry, the Government ought to improve the agricultural system, make it greener. Dogs can have double the meat consumption & related carbon footprint of many humans. Excerpts: “In the US, there are more than 163 million dogs and cats that consume, as a significant portion of their diet, animal products and therefore potentially constitute a considerable dietary footprint. Here, the energy and animal-derived product consumption of these pets in the US is evaluated for the first time, as are the environmental impacts from the animal products fed to them, including feces production. They produce about 30% ± 13%, by mass, as much feces as Americans… and through their diet, constitute about 25–30% of the environmental impacts from animal production in terms of the use of land, water, fossil fuel, phosphate, and biocides. From a 2016 newspaper article: “New Zealand needs to get rid of 80 per cent of its dairy cows because dairying is dirtying our water. That was the message delivered to the annual meeting of Wanganui Federated Farmers by its former president. Rachel Stewart, president of the group for four years in the early 2000s and guest speaker at Friday’s annual meeting, is an “ardent critic” of farming. Ms Stewart, recently crowned Opinion Writer of the Year at New Zealand’s premier journalism awards, began her talk by saying she loved farming – but dairy farming was responsible for 80 per cent of the degradation of New Zealand waterways and Federated Farmers needed to stop denying it. This year’s Budget allocated $100 million over 10 years to cleaning up waterways. From an article in National Geographic titled “Water Conservation Tips” excerpt: “The water it takes to produce the average American diet alone—approximately 1,000 gallons per person per day—is more than the global average water footprint of 900 gallons per person per day for diet, household use, transportation, energy, and the consumption of material goods. Reference: “The water footprint of soy milk and soy burger and equivalent animal products”, Twente Water Centre, University of Twente, The Netherlands; United Nations Environment Programme. From a 1997 article in the Cornell Chronicle of Cornell University USA: “Animal agriculture is a leading consumer of water resources in the United States, Pimentel noted. Grain-fed beef production takes 100,000 liters of water for every kilogram of food. Raising broiler chickens takes 3,500 liters of water to make a kilogram of meat. In comparison, soybean production uses 2,000 liters for kilogram of food produced; rice, 1,912; wheat, 900; and potatoes, 500 liters. “Water shortages already are severe in the Western and Southern United States and the situation is quickly becoming worse because of a rapidly growing U.S. population that requires more water for all of its needs, especially agriculture,” Pimentel observed. Livestock are directly or indirectly responsible for much of the soil erosion in the United States, the ecologist determined. On lands where feed grain is produced, soil loss averages 13 tons per hectare per year. Pasture lands are eroding at a slower pace, at an average of 6 tons per hectare per year. But erosion may exceed 100 tons on severely overgrazed pastures, and 54 percent of U.S. pasture land is being overgrazed. In one sense, urban food consumers are also consuming rivers. Small changes in food choices could potentially lead to water savings that dwarf the savings that can come from changes in direct water consumption. Thus, river condition is, to some extent, a consequence of decisions made in urban supermarkets. Excerpt regards deforestation: “Large-scale dairies exist in Europe, too, but are generally much smaller than those in the United States. The expiration on April 1 of European Union milk quotas, in place for more than 30 years to prevent overproduction, is likely to lead to an expansion of such intensive farming, said Sandra Vijn, dairy director for the World Wildlife Fund in Washington.